The HD4 is the strongest of the HD series. It features four 16 inch tall, 4.8 inch wide tires and has a True 2000 pound weight capacity but only weighs 100 pounds. The tires are 6 ply boat trailer tires and have a weight rating of 760 pounds each. That's 3,040 pounds of weight capacity on the tires. 1,000 pounds on the HD4 dolly is only 1/3 of its capacity on the tires and will not even look like anything is on it. 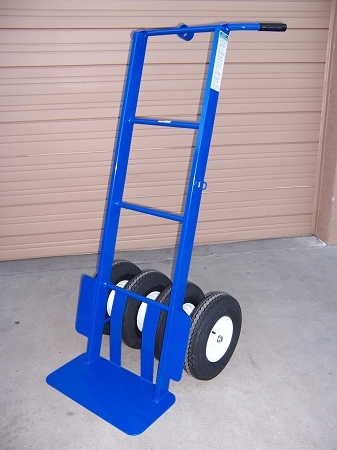 We offer this dolly with optional brakes to make pulling back easier. The HD4 heavy duty dolly is virtually unbreakable. Moving 700-900 pounds has never been easier. One strong person can pull back and carry 600-700 pounds through grass, rocks, sand, and snow. And it fits through 36" doorways or gates! The HD4 heavy duty dolly is virtually unbreakable and mainly used for items such as Inflatables, Giant Slides, Moonwalks, Boulders. Box Trees, Kettle Corn pots, Large Catering Companies, Marching Band Equipment, Military operations, Fountains and Statues, Design and Build companies, Heavy Construction, Off-Road Truck, and Tractor Tires. The HD4 has a special feature to convert into a utility trailer for easy carrying up trailer ramps and movement across long distances effortlessly. Once you use this dolly you will never know how you worked without it. You must invest in quality equipment for the future and throw away the hay dollies from Harbor Freight and Tractor Supply. We have been manufacturing this dolly since 2005 and have hundreds of satisfied customers. 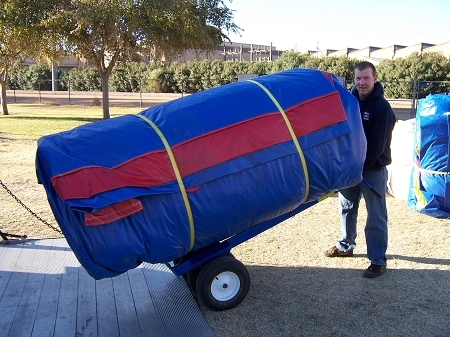 The dolly comes complete with a printed safety manual, instructional video, 2 Plastic wheel chocks to hold the wheels while pulling the load back and a heavy-duty ratchet strap to hold the inflatable to the dolly. Our HD or heavy-duty dolly series have large steel frames with 1/4" thick steel lifting plates. Perfect for tackling the most demanding projects. Large enough to carry 1000 pounds and still fit through a 36-inch residential gate or commercial doorway. Rest assured that all products purchased from Kids Attractions will be high-quality commercial grade equipment. "The Quality Remains Long After the Price is Forgotten"
This dolly is absolutely GREAT! My employees fight over it and have given it a name "Big Bull". I will certainly be purchasing more.. My employees are already saying which truck gets the BIG BULL? Thanks! Excelente Carretilla. Ahora podemos entregar inflables con menos empleados. Estamos super satisfechos con la compra de esta carretilla. Tenemos inflables muy pesados que antes nos costaba mucho trabajo llevar a las fiestas. Ahora nuestros empleados se pelean por esta carretilla pues hace el trabajo mas facil. Se ha convertido en una herramienta indispensable en nuestro trabajo. Vamos a comprar mas. La recomendamos mucho. Everything was actually better than expected. For most jobs, my guys prefer the one with the rear caster, but this one gets high marks from everyone who has used it. We have the brake, which everyone loves. Excellent quality. Well worth the money. This is our 5th dolly plus we have the trailer tow. Only unit my warehouse manager will use. I bought one different at IAAPA and he disassembled it. Truly a great unit. Purchase the HD4 to help with my bigger units and its the best decision I ever made. Its very big but it gets the job done and will be buying more in the near future. Q: do you have the option to have solid tires? I always run into my air tires being flat. Our air filled tire will way outperform solid tires in every way. Solid tires are heavy and only rated at around 200 pounds each. Our air-filled tires are professional grade and have a super high weight capacity and 3-year warranty. Q: What's the height and width of the dolly ? Lower Lifting Plate: 12" x 24"